We’d love your help. Let us know what’s wrong with this preview of Ghosts of Tsavo by Philip Caputo. To ask other readers questions about Ghosts of Tsavo, please sign up. 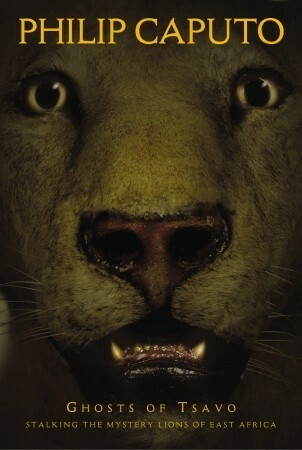 The book opens with gripping tales of lion hunting in Africa. There was the famous tale of two man-eaters in Tsavo, Ghost and Darkness, which had killed and devoured hundreds of humans at the end of the 19th century. There have been other outbreaks. Why? What makes these man-eaters different from the wooly-maned lords of the Serengeti? The opening, the first couple of chapters, is wonderful, but it is downhill from there, mostly following Caputo as he accompanies others in their research or hunt The book opens with gripping tales of lion hunting in Africa. There was the famous tale of two man-eaters in Tsavo, Ghost and Darkness, which had killed and devoured hundreds of humans at the end of the 19th century. There have been other outbreaks. Why? What makes these man-eaters different from the wooly-maned lords of the Serengeti? The opening, the first couple of chapters, is wonderful, but it is downhill from there, mostly following Caputo as he accompanies others in their research or hunting. Caputo raises the possibility that the short-maned 19th century killers were members of a subspecies of lion, a throwback to an earlier, cave-dwelling ancestor. These lions (preserved in the Field Museum in Chicago) have physical differences from the usual lion. They are taller, heavier, but with smaller skulls. In reading, I was hoping that DNA analysis would resolve the dispute, but it appears not to have entered the debate. We are left with musings about the alternative possibilities. Differences in lions, and in their interest in feeding on humans, might be understood in different ways. Availability of food was one determining factor. In areas with ample game there was little need to add humans to the menu. But when prey is scarce, people become more likely targets. Also, the Tsavo lions, lived a hard-scrabble existence, one in which their primary prey was Cape Buffalo, one of the most dangerous creatures on the continent. Although these lions adapted by becoming larger, taller, with more powerful forelegs and shoulders than their Serengeti cousins in order to survive on such a difficult diet, people were an easy choice when available. What is the significance of lion manes? It appears that there is a tradeoff between status, advertising advantage, and body heat management cost. The darker the mane the healthier, the stronger the male lion is likely to appear. But only to a point. As one moves lower in elevation, the hotter it gets, and the more that mane costs. That may be why all not all adult males have manes. This is a book about man-eating lions. You may as well stop reading this review now, because can you really go wrong? I mean, even though the author went to Africa to work with researchers in the hopes of gaining scientific knowledge of the animals, is it wrong that my favorite parts were accounts of the man-eating itself? Different researchers have different theories about the lions of Tsavo and they carry out careful experiments in an attempt to uncover answers. Are the mane-less lions of this This is a book about man-eating lions. You may as well stop reading this review now, because can you really go wrong? I mean, even though the author went to Africa to work with researchers in the hopes of gaining scientific knowledge of the animals, is it wrong that my favorite parts were accounts of the man-eating itself? Different researchers have different theories about the lions of Tsavo and they carry out careful experiments in an attempt to uncover answers. Are the mane-less lions of this region a separate species? Are they products of their environment, harsher than that of the Serengeti lions? Are they truly man-eaters by nature or is this just a backup plan for sick and injured individuals? These are the questions the author attempts to answer in his journeys. Interesting stuff. Where the book falters, in my opinion, is when the author - an otherwise engaging writer - waxes on about the humility he feels in being out in the field and finding he's not the top predator in the food chain. It's a fair enough observation the first time, but after one too many wide-eyed discussions of it and references to god, it comes across as naive from someone who's a professional writer in his 50's. Has this man never gone outside before? Has it never occurred to him that other animals don't see as us as their lords and masters, but as chucks of meat? I don't think you have to face man-eating lions to experience this - I have felt like prey in California cougar country or encountering bears in the Shenandoah Valley. I will give him credit though in that towards the end of the book, he lets it be known that one of the researchers seems to be sick of hearing him talk about this. I hear ya. Caputo travels through Kenya stalking lions alongside scientists with opposing views on why these particular animals in Tsavo sometimes track, kill, and eat humans. Tsavo means place of slaughter in KiKamba. Generally, when referred to geographically, Tsavo refers to Tsavo East National Park in Kenya. This area is noted for lions. More spefically-man-eating lions. In 1898, two man-eating lions nicknamed Ghost and Darkness, killed an estimated 135 people. Another noted period of man-eating lion te Caputo travels through Kenya stalking lions alongside scientists with opposing views on why these particular animals in Tsavo sometimes track, kill, and eat humans. Tsavo means place of slaughter in KiKamba. Generally, when referred to geographically, Tsavo refers to Tsavo East National Park in Kenya. This area is noted for lions. More spefically-man-eating lions. In 1898, two man-eating lions nicknamed Ghost and Darkness, killed an estimated 135 people. Another noted period of man-eating lion terror occurred in the early 1990s. Man-eaters have taken people before, in-between, and since these two studied periods in Kenyan and wildlife research history. Caputo tracks lions with two groups of scientists who hold opposing views on why the lions in this particular part of Africa 1)don't have manes and 2)sometimes use people as a food source. Is it evolution? Is it food source issues? Is it the geography? Are the lions passing the want for human flesh to their young? Or is it all nonsense? Several of the scientists prove to be interesting characters. Some of them take a disproved hypothesis personally. Caputo describes Africa in both picturesque and horrifying terms. Forget the idea of a safari for rich white people. It is hot. There are insects carrying diseases that will easily kill you. A rhino, hippo, lion, or water buffalo could charge and you and remove chunks of your body before you'd even think to run. He tempers this harsh living with sunsets of unspeakable beauty and quiet moments of amazement at how wild Africa is. It's not the "wild" of a naive tourist. It is a primeval wild. Never mind all the theories. Yes, the research is fascinating. However, my favorite thing about this book was the details of how the lions would choose particular people to eat. I loved the descriptions of their day-to-day behavior, even the lazy parts (of which there are many, lions are very lazy). The author writes of his trips to east-central Africa on photographic safari, tracking the lions of Tsavo, and his adventures. Apparently safari vacations, at least in the Tsavo, are not for the faint of heart -- it's close to 100 degrees all the time, you're very far from civilization, there's a real chance of getting mauled and/or eaten by some wild animal, and there a This is a sort of combination science and travel book. Unfortunately the "science" side was much weaker than the "travel" side. Recommended to Mark by: Movie, "The Ghost and the Darkness"
If you've seen the movie, "The Ghost and the Darkness" (Val Kilmer & Michael Douglas), you are going to want to read this book and get a notion about what makes a "man-eater. "You are going to want to know about how a large predator like a lion goes about killing and eating you. Caputo eloquently waxes poetic about the African "bush" and laments the effect progress has had on the environment, the culture and the wildlife. The author, a Vietnam veteran of note, has his moments on "safari" inclu If you've seen the movie, "The Ghost and the Darkness" (Val Kilmer & Michael Douglas), you are going to want to read this book and get a notion about what makes a "man-eater. "You are going to want to know about how a large predator like a lion goes about killing and eating you. Caputo eloquently waxes poetic about the African "bush" and laments the effect progress has had on the environment, the culture and the wildlife. The author, a Vietnam veteran of note, has his moments on "safari" including an unlikely NDE ( "near death experience") that will surprise you. At the time the author also notes the sorrow that he is is experiencing as his mother suffers from dementia. That touched me in many ways. I have read several books of this subject and have found all of them astounding and intriguing. To know this is a true story of two lions doing what had never been something lions did in pairs is amazing. If you haven;t rad the books, this one or others, pick them up. I also loved the movie "The ghost and the darkness" linked to the books. Exploration of what makes a lion become a man-eater. A bit of a Kenya travelogue and serious investigation of the behavior of maned and in-maned lions. Fascinating. Very interesting read! Gives a whole new prospective on lion behavior. Enjoyed the chapters about the Man Eater of Mfuwe and the Tsavo Man-Eaters, but I got so bored with the rest of the book and just kinda stopped reading it. They were called The Ghost and The Darkness, two adult male African lions, that haunted the scrub brush of the Tsavo River at the turn of the century. In 1898, they killed more than 135 Indian and African railway workers, laboring to throw a bridge across the Tsavo River, before Lt. Col. John Patterson, in an epic and harrowing nine-month struggle, hunted the lions down and killed them. Today the lion's are stuffed and displayed in the Field Museum in Chicago, but the question of what spawned the They were called The Ghost and The Darkness, two adult male African lions, that haunted the scrub brush of the Tsavo River at the turn of the century. Today the lion's are stuffed and displayed in the Field Museum in Chicago, but the question of what spawned their behavior, what drove them to become that most feared of all animals ( to us anyway) - a maneater, remains unanswered and mainly unexamined by science. In the Ghosts of Tsavo, Phil Caputo, author of A Rumor of War, Horn of Africa, and numerous other books, examines the Tsavo lions, looking at two separate lines of scientific research that are now attempting to explain supposed behavioral and physical differences (Tsavo lions are maneless - sometimes, very aggressive, and may be a subspecies of lion that was thought to have died out 8,000 years ago) between Tsavo lions and other African lions. Journeying into the field with the scientests, Caputo offers a welcome insight into the scientific methodology in studying these animals, and brings a raw, visceral sense of the dread, fear, strength and admiration that the lions can generate. Tsavo, in case you are interested, means "place of slaughter". At times Caputo's writing is, by turns, chillingly effective at making the reader aware of the power of the lion and why so many of us fear the dark beyond the fire, mixed with the more clinical approach of scientific study. There is an undercurrent of Caputo's awareness of his own mortality ribboning through the story that makes the lions appear less of an animal, and more of a archetype of death, staring at you with yellowed, predatory eyes. The book is generally engrossing but at times the abrupt shift in tone is disconcerting and uneven. As with most scientific studies, there is no real conclusive point to the lion study, or for that matter to the book. It is a good tale of a journey, but a final arrival at a destination would have also been nice. For more about the Tsavo lions, read Col. Patterson's Maneater's of Tsavo for the definative account (and a rippin' great adventure story to boot (if a trifle Victorian in tone)). You can also download it (and many other public domain texts) free from Project Gutenberg. This is a shame. What starts as a fascinating account of the lions of Tsavo and their predilection for man eating quickly becomes the wandering, directionless travelogue of a tourist. The first few chapters are full of compelling stories about the man eaters, most notably the famed pair that plagued the railroad construction and were finally killed by Patterson and later stuffed and displayed in the Field Museum. These early chapters are packed full of anecdotal evidence that these maneless man This is a shame. What starts as a fascinating account of the lions of Tsavo and their predilection for man eating quickly becomes the wandering, directionless travelogue of a tourist. The first few chapters are full of compelling stories about the man eaters, most notably the famed pair that plagued the railroad construction and were finally killed by Patterson and later stuffed and displayed in the Field Museum. These early chapters are packed full of anecdotal evidence that these maneless man eaters are quite possibly a different, older species than the well known, golden maned lions of nature shows. They have bigger teeth, some say. They live in caves, some say. They don't grow manes...like saber tooth tigers. This is all a tremendous start for what is sure to be a book that explores its own early promises...right? Think again. After a great introduction, Caputo joins the hunt himself- by going on a safari in Tsavo. Here we're treated to his random musings on Africa, very little information on lions, and an odd lambasting of tourists, which he most certainly is one himself. Perhaps he thinks that an interview or two precludes him from the distinction, but lets face it; he took his wife on vacation and thought it was worth a few chapters. Nice try, but you're a tourist so get off your horse, friendo. On a return trip, he actually meets up with some scientists and participates in a few hilariously stupid 'experiments' involving dummy lions in an attempt to unravel the purpose of manes. Sadly, but maybe not surprisingly, the scientists involved didnt give much credence to the theory that Tsavo lions are genetically different. Naturally, they put little or no effort into studying the thought further. Remember kids, any evidence can be used to backup your hypothesis if you write your thesis creatively. Unfortunately they were there to find what they were looking for and no more. Pity. Oddly enough, by the end the author himself admits that he doesn't want to know more about the elusive title creatures. Not to pry, but why the hell did you write a book on the topic then, guy? Caputo starts strong, delivering a fascinating and chilling account of Ghost and Darkness, the legendary man-eaters. Unfortunately the book goes downhill from there. He mostly tags along with researchers and guides, and while this premise held potential, in my opinion he drops the ball. Caputo also makes it clear on several occasions that he pits science and wonder at opposite ends of the spectrum, and quite frankly comes off as smug, humble-bragging that *he* is satisfied without knowing the in Caputo starts strong, delivering a fascinating and chilling account of Ghost and Darkness, the legendary man-eaters. Unfortunately the book goes downhill from there. He mostly tags along with researchers and guides, and while this premise held potential, in my opinion he drops the ball. Caputo also makes it clear on several occasions that he pits science and wonder at opposite ends of the spectrum, and quite frankly comes off as smug, humble-bragging that *he* is satisfied without knowing the intricacies of lion biology and ecology, and even disparaging of the researchers who graciously allowed his presence. It's worth noting that this review is written a month or two after I finished the book. The details have faded, but I still find myself thoroughly annoyed with and put off by the writer. As far as I'm concerned he hasn't earned the right to act as a mouthpiece for anything science-related. In the late nineteenth century John H. Patterson, of the British Army, tracked and killed two man-eating lions in Tsavo, East Africa. Almost one hundred years later Philip Caputo revisits this area to try and uncover the truth about the lions of this area. They are larger than our typical view of a lion. The males are usually maneless and their ferocity is well-documented. What makes these lions different? Are they a unique sub-species, are they direct descendants of a larger prehistoric ancestor? In the late nineteenth century John H. Patterson, of the British Army, tracked and killed two man-eating lions in Tsavo, East Africa. Caputo is of course a great writer. In this book he combines multiple storylines, viewpoints and personal experiences into a really meaningful examination of the myth and reality of the Tsavo lions, both in the modern day and in their original context. I can't say enough good things about the read. You won't want to put it down, and if you have a serious interest in the morphology and reality of Patterson's lions, then you'll go back to it again and again. If you're like me and the lions at Field Caputo is of course a great writer. In this book he combines multiple storylines, viewpoints and personal experiences into a really meaningful examination of the myth and reality of the Tsavo lions, both in the modern day and in their original context. Great retelling of the original account of the "Maneaters of Tsavo" by Kenneth Anderson. I read this book after seeing 'The Ghost and the Darkness" and enjoyed it. As always what lingers is the intelligence of these animals and what it must have been like to be at their receiving end while building the Mombasa railway line. This text reads as parts nature book, mystery, and travelogue. Caputo captivates his audience weaving his own expedition into Tsavo and its lions with the tales from John Patterson's personal narrative that inspired the 1996 film The Ghost and the Darkness. I would recommend this as an accompaniment to the film. An interesting, sometimes gripping, mix of travelogue, science, history, and mystery in which Caputo attempts to separate reality from myth as he investigates stories of maneless, man-eating lions in East Africa. Picked this one up at the Field Museum in Chicago after seeing the man-eating African lions on display. If you're into science, it's a good book for you, though I would recommend reading it as a companion text for the Val Kilmer/Michael Dougles movie "The Ghost and The Darkness." Although I was inspired to read more about the lions of Tsavo and Africa, I basically think this was Phillip Caputo's way of getting a publisher to pay for a safari trip to Africa. And Phillip Caputo is one of my favorite authors, so I say that with love. Speculation that the maneless man-eaters of Tsavo are a sub-species of the Serengiti lion. 250-500 lbs heavier and up to a foot taller, these lions have been known to develop a taste - as well as specialized hunting techniques - for humans. tracking the unmaned lions of east africa and determimining why they tend to be man-eating compared to their fully-maned cousins on the Serengheti. Interesting but somehow not that fulfilling, as the researchers ultimately never really have much contact with the lions. A look into man eating lions, going from the killing of a man eater in the early 1990s to the Ghost and the Darkness themselves. Interesting look at the causes and effects of what brought on the attacks and part Afirican travel book as the author travels to Tsavo himself. Very nice scientific review and follow-up of the man-eating lions of Tsavo. Of course, cannot compare to that volume for terror and a thrilling tale, but a nice addition to the scientific understanding of why these lions might behave in some of the ways that they do. So far I really like this book. Interesting. American author and journalist. Author of 16 books, including the upcoming novel SOME RISE BY SIN. Best known for A Rumor of War , a best-selling memoir of his experiences during the Vietnam War (look for the special 40th Anniversary Edition in summer 2017).